Today I was scrolling down through the feed of my Sweatpink ambassadors group awhat did I nd saw quite a few of these fun Try This Thursday posts and thought I'd give it a try! So what did I try that was new (to me)? Last Friday, my husband asked me what was for dinner. My default answer on Fridays is usually pizza. I am done with the week, done cooking, done with it all. I told him I wasn't really sure and he asked about having salad. This is a majority rarity, so I jumped on it. Next thing I know, we had planned to make a version of this salad. Dressing- italian for him and strawberry balsamic vinaigrette for me. This was a super easy meal that I could recreate quickly in the future. I threw the chicken on the grill- slightly seasoned with some stock "Italian seasoning,." Once they cooled off a bit, I sliced them and moved on to prepare the rest. I cut up the lettuce into smaller shreds and sliced the apples. I threw these into a large bowl, then proceed to add all the other (DELICIOUS) ingredients. I mixed everything around nicely and then served on our plates. 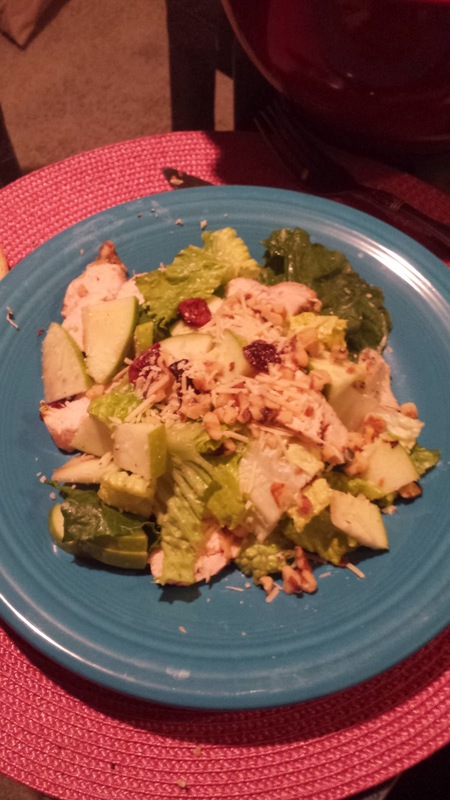 We each added our dressing to our individual plates and were equally smitten with this new found salad. The leftovers actually kept very well for the weekend by using cling wrap to cover the bowl. I will I had more pictures of the process of everything, If I had only known I'd write a blog about it! Next time, my friends. Well that was fun, thanks for letting me link up to Jess at Hello to Fit and Ivanna at Petite Heartbeat. Have you ever put your own twist on a popular salad?